RUSSELL, Violet Estella - Age 84, of Fenton, died Sunday, February 3, 2019. Funeral services will be held 1:00 PM Tuesday, March 5, 2019 at Sharp Funeral Homes, Fenton Chapel, 1000 Silver Lake Road, Fenton. Chaplain Tara Seth officiating. Burial in White Lake Township Cemetery, White Lake. Visitation will be held at the funeral home Monday, March 4, 2019 from 1-9 PM. Those desiring may make contributions to the Michigan Humane Society. Violet was born November 29, 1934 in Hart, the daughter of John and Lillian (Case) Oles. She married Raymond Lester Russell May 8, 1978 and he preceded her in death October 23, 2008. She had resided in Fenton for the past 3 years, coming from Davisburg. Surviving are: her children, Kathleen Watson Dixon of Fenton, Bobby Eugene Watson of Greenfield,TN, Bessie Watson of Holly, and Shirley Whitham of Davisburg; 9 grandchildren, 21 great grandchildren, and 5 great-great grandchildren; step children, Frankie Russell of Mt. 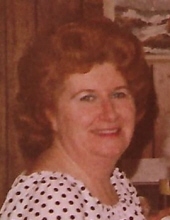 Morris, Taffada Wethy of Waterford, and Raymond L. Russell, Jr. of Dayton, OH; 5 step grandchildren and 10 step great grandchildren; brothers, Clifford Oles of Hesperia and John Oles of Hesperia; sister, Delia Brower of Pentwater; and several nieces and nephews. She was also preceded in death by her parents; son, Rick Eugene Watson; daughter, Sharon K. Watson; and her siblings, Evelyn, Emmajean, Edna, Jack, Larry, and Rosemary. Tributes may be shared at www.sharpfuneralhomes.com. To send flowers or a remembrance gift to the family of Violet Estella Russell, please visit our Tribute Store. "Email Address" would like to share the life celebration of Violet Estella Russell. Click on the "link" to go to share a favorite memory or leave a condolence message for the family.